이 섹션에서 여러분은 client 에 응답할 HTML 을 생성하는 작업을 깔끔하게 캡슐화하는 Razor view template 을 사용하기 위해 HellowWorldController class 를 수정합니다. 여러분은 Razor 를 사용하는 view template file 을 생성합니다. Razor 기반 View template 은 cshtml 확장자를 갖습니다. C# 을 사용하여 HTML output 을 생성하는 우아한 방법을 제공합니다. 현재 index method 는 controller class 에서 hard-cord 된 string 의 message 를 반환합니다. HelloWorldController class 의 index method 를 다음 코드로 변경합니다. 진행되는 code 는 view object 를 반환합니다. Browser 에 HTML 응답코드를 생성하기위해 view template 을 사용합니다. 위 index method 같은 Controller method (action method 로 알려진) 는 일반적으로 string과 같은 Primitive 한 형식이 아닌 IActionResult (또는 ActionResult 에서 파생된 class) 를 반환합니다. Views Folder 를 오른쪽 클릭합니다., 그리고 Add > New folder 를 선택합니다. 그리고 folder 이름을 "HelloWorld" 로 지정합니다. Views/HelloWorld folder 를 오른쪽 클릭합니다. 그리고 Add > New Item 을 선택합니다. 오른쪽 상단의 search 입력란에 view 를 입력합니다. 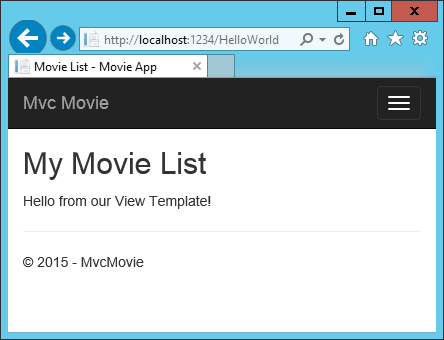 MVC View Page 를 Tap 합니다. Name 입력란에 필요하다면 이름을 index.cshtml 로 변경합니다. Views/HelloWorld/index.cshtml Razor View 파일의 내용을 다음의 코드로 변경하십시오. HelloWorldController 의 index method 는 많은 일을 하지 않습니다. 구문을 실행하고 View(); 를 반환하는 함수를 지정하는데, Browser 에 보낼 응답을 render 하기 위해서 View template 을 사용해야 합니다. View template file 의 이름을 명확하게 지정하지 않았기 때문에 MVC 는 기본적으로 Views/HelloWorld 폴더내의 index.cshtml view file 을 사용합니다. 아래의 이미지는 View 에 Hard Cording된 "Hello from our View Template!" 이라는 문자열을 보여줍니다. 만약 여러분의 browser 창이 작다면( 예를들어, mobile device 처럼 ), Home, About, Contact 링크를 보기위해서 우측상단의 Bootstrap navigation button 을 toggle (tap)할 필요가 있습니다. menu link (MvcMovie, Home, About) 를 Tap 합니다. 각 페이지는 동일한 menu layout 을 보여줍니다. menu layout 은 Views/Shared/_Layout.cshtml file 에 구현되어 있습니다. Layout template 을 사용하면 여러분 사이트의 HTML container layout 를 한곳에서 지정할 수있으며 여러분 사이트의 여러페이지에 적용됩니다. RenderBody 는 여러분이 만든 모든 view page 가 layout page 상에 보이도록 wrapping 된 Placeholder 입니다. 예를 들어, 만약 여러분이 About link 를 선택한다면, Views/Home/About.cshtml View 가 RenderBody method 내부에 rendering 됩니다. 아래 Highlight 된 코드처럼 Layout template 의 anchor text 를 "Movie App" 으로 변경하십시오. 그리고 Controller 를 Home 에서 Movies 로 변경하십시오. 참고 : ASP.NET Core 2.0 version 은 약간 다릅니다. 아직 Movies Controller 를 구현하지 않아서 해당 Link 를 클릭하면 404 (Not Found) 오류가 발생합니다. 변경사항을 저장하고 About Link 를 Tap 하십시오. browser tab 의 Title 에 About - Mvc Movie 대신에 About - Movie App 을 표시하는 방법에 주의하여 보십시오. Contact Link 를 Tap 하여 Movie App 이 표시되는 것 또한 주의하여 보십시오. Layout template 을 한번 변경하면 Site 의 전체 페이지에 새로운 링크와 새로운 title 이 반영하는 것이 가능했습니다. Views/_ViewStart.cshtml file 은 Views/shared/_Layout.cshtml file 을 각 View 에 전달합니다. Layout property 에 다른 layout view 를 설정하거나 Null 을 설정하여 아무런 layout 을 사용하지 않도록 할 수 있습니다. 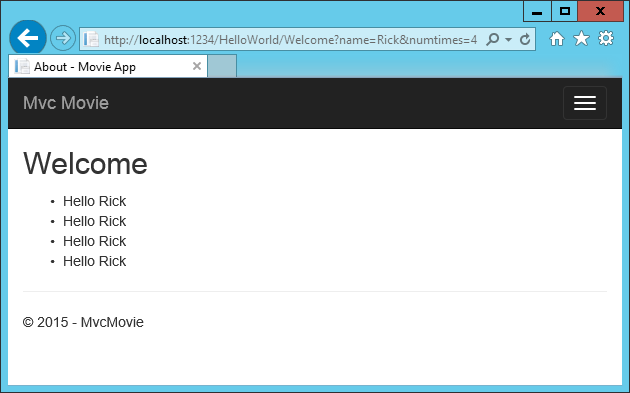 Views/HelloWorld/Index.cshtml 을 엽니다. 두군데를 수정합니다. browser 의 title 에 나타나는 text. 코드의 어느부분을 변경하면 app 의 어느부분이 바뀌는지 약간의 차이점을 알수 있습니다. 위 코드의 ViewData["Title"] = "Movie List"; 는 ViewData dictionary 의 Title 속성을 "Movie List" 로 설정합니다. Title 속성은 Layout page 의 <title> HTML element 에서 사용됩니다. 변경사항을 저장하고 http://localhost:xxxx/HelloWorld 로 이동하십시오. browser title, Primary Heading, Secondary Heading 이 변경되었는지 주의해서 살펴보십시오. browser title 이 ViewData["Title"]로 생성되어 index.cshtml template 에서 설정되고 추가적으로 " - Movie App" 이 Layout file 에서 추가됩니다. 또, Views/Shared/_Layout.cshtml view template 과 browser 로 보내진 single html response 가 어떻게 병합되어 index.cshtml view template 의 content 가 만들어지는지 주의하여 살펴보십시오. Layout templates 를 변경하여 적용하면 application 의 모든 페이지 걸쳐 정말 쉽게 변경됩니다. 더 자세한 내용은 Layout 을 참조하십시오. 약간의 data ( 여기서는 "Hello from our View Template" 이라는 message) 는 Hard coding 되어 있습니다. 이 MVC application 에는 "V" (view) 가 있고 "C" (controller) 를 만들었지만 아직 "M" (model) 은 없습니다. Controller 의 actions 는 들어오는 (incoming) URL request 에 대한 response 에서 호출됩니다. controller class 는 들어오는 browser request 를 처리하는 코드를 작성하는 곳입니다. controller 는 data source 로 부터 data 를 retrieve 하고 browser 에 돌려보낼 response 의 type 을 결정합니다. View template 은 controller 에서 browser 로 보내질 HTML response 를 생성하고 형식을 지정할 수 있습니다. controller 는 view template 이 response 를 rendering 하기위해 요구되는 data 를 제공해야할 책임이 있습니다. 모범 사례 : View template 은 business logic 을 수행하거나 database 와 직접 상호작용을 하면 안됩니다. 대신 view template 은 오직 controller 가 view 만들 위해 제공하는 data 와 작업해야합니다. 이 관심의 분리( "separation of concerns" ) 를 유지하면 여러분의 코드를 깨끗하고, 테스트 가능하고 유지보수가능하도록 하는데 도움이 됩니다. 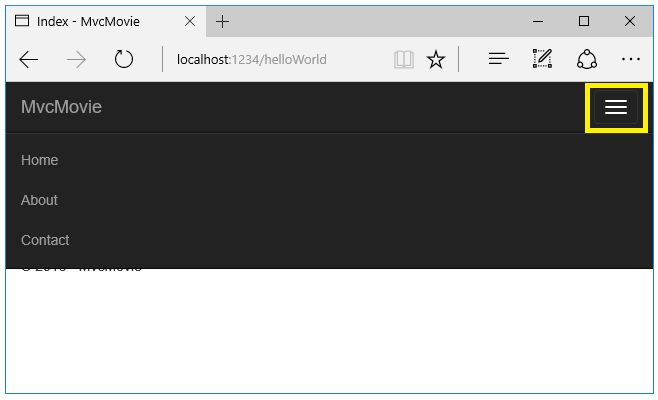 현재 HelloWorldController class 의 Welcome method 는 name 과 ID 를 매개변수로 취하여 browser 로 값을 직접 출력합니다. controller 가 response 를 string 으로 rendering 하도록 하기보다. controller 가 view template 을 대신 사용하도록 변경합시다. view template 은 동적 response 를 생성합니다. 이 것은 response 를 생성하기 위해서 적절한 bit 의 data 를 controller 에서 view 로 전달해야할 필요가 있다는 것을 의미합니다. view template 이 필요한 data 를 controller 에서 dynamic data( parameters) 인 view template 이 접근 가능한 ViewData dictionary 에 담음으로써 이 작업이 가능합니다. HelloWorldController.cs file 로 돌아가서 ViewData dictionary 에 Message 와 NumTimes 를 추가하도록 Welcome method 를 변경합니다. ViewData dictionary 는 dynamic object 입니다. 즉 여러분이 원하는 것은 어떤 것도 집어 넣을 수 있습니다. ViewData object 는 여러분이 그 안에 무언가를 넣기 전까지 정의된 속성이 없습니다. MVC model binding system 은 address bar 에 적힌 query string 에서 이름있는 매개변수( name 과 numTimes )를 추출하여 여러분이 만든 method 의 parameter 로 자동적으로 mapping 합니다. 완전한 HelloWorldController.cs 파일의 내용은 다음과 같습니다. ViewData Dictionary 객체는 View 에 전달할 data 를 포함하고 있습니다. Views/HelloWorld/Welcome.cshtml 라는 이름의 Welcome view template 을 생성하십시오. Welcome.cshtml view template 내에 "Hello " NumTimes 를 표시할 Loop 를 생성합니다. 아래 코드로 Views/Helloworld/Welcome.cshtml 의 내용을 변경합니다. 변경사항을 저장하고 다음 URL 로 이동하십시오. 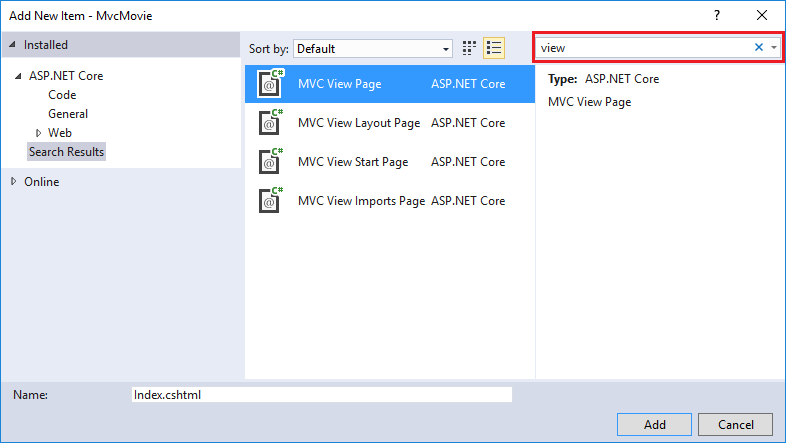 Data 를 URL 에서 가져와서 MVC model binder 를 이용하여 controller 에 전달합니다. controller 는 data 를 ViewData dictionary 에 packages 하고 View 에 그 Object 를 전달합니다. 그 다음 view 는 HTML data 를 browser 에 render 합니다. 위 sample 에서 controller 로 부터 view 로 data 를 전달하기위해서 ViewData Dictionary 를 사용했습니다. 다음 tutorial 에서는 controller 에서 view 로 data 를 전달하기위해서 view model 을 사용합니다. data 를 전달하는 view model 접근 (approach) 은 일반적으로 ViewData dictionary 접근 보다 훨씬 더 좋습니다. 자세한 사항은 ViewModel vs ViewData vs ViewBag vs TempData vs Session in MVC 를 참조하십시오. 그럼, 여기서 M 은 model 을 말하는 것이지 database 를 의미하지 않습니다. 배운 것을 바탕으로 Movie database 를 생성해 봅시다. 번역?이 이상하고 맘에 들지 않지만 참고로 보시기 바랍니다.